Arrival at Siem Reap International Airport. Meet and greet by your local guide before transfer to the hotel for check in. After check in – time free. At around 16:00 hr, start the intro tour around the capital. By Remork (Tuk Tuk). Relax at Spa in the hotel or enjoy a 60 minutes massage at the Body Tune or Bodia Spa, place of professional in massage. After breakfast – start the visit to Kampong Phluk floating Village. 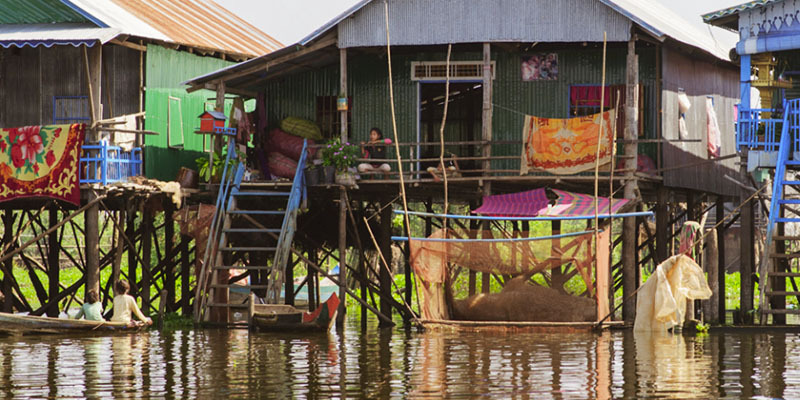 Kampong Phluk is a cluster of three villages of stilted house built within the floodplain of the Tonle Sap about 22km southeast of Siem Reap. The name means “harbor of the tusks”. 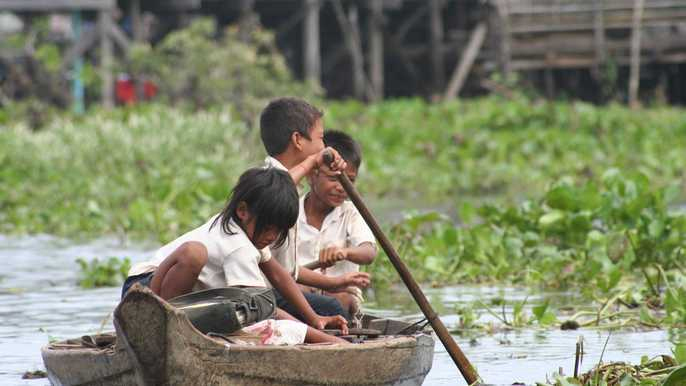 The villages are primarily Khmer and have about 3000 inhabitants between them. Flooded mangrove forest surrounds the area and is home to the variety of wildlife including crab-eating macaques. On the way back, stop at a local market at Rolous. Walk around this market and see the local selling fruits, vegetables, and many other local products. Visit & shooting some pictures, take about 20 minutes before continuing to the temples in Rolous group, “Preah Ko, Bakong & Lolei”. Return back town and have lunch at local restaurant. Visit the temples at the grand circuit. First visit Preah Khan, the temple is located 2 kilometers north-east of Angkor Thom on the Grand Circuit. The Buddhist complex covers 56 hectares served as the nucleus of a group that includes Neak Pean and Ta Som, located 4 kilometers long Jayatataka Baray-the last of the great reservoirs to be built in Angkor. Prasat Eastern Mebon, a pyramid of receding terraces on which are placed many detached edifices, the most effective being the five towers which crown the top Could any conception be lovelier, a vast expanse of sky-tinted water as wetting for a perfectly ordered temple. Then, visit Pré Rub and stay for sunset at Pre Rub ! * Note: Because the temple is built entirely of brick and laterite, the warm tones of these materials are best are seen early in the morning or when the sun is setting. There are two views from the top terrace: the first looking east towards Phnom Bok and the mountain chain of Phnom Kulen; and the second looking west where the towers of Angkor Wat can be distinguished on the far horizon. After breakfast – drive straight to the temple of best arts carving, Banteay Srei. 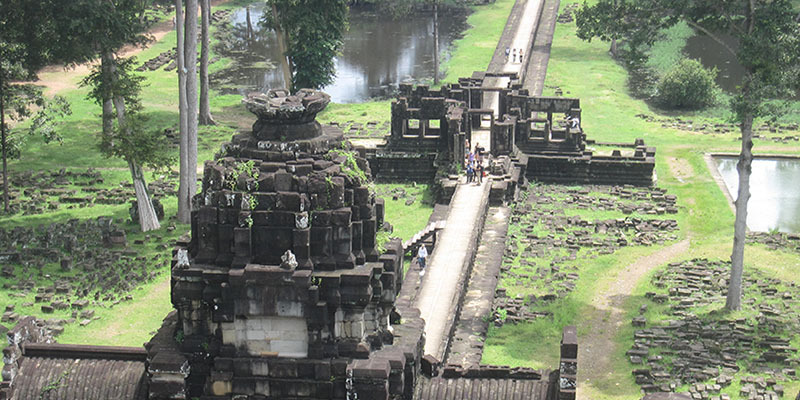 The temple is located on the north-east of East Mebon, on the distance of 25 kilometers (15.5 miles). On the way back, visit the sugar production in the village before continuing the visit to Akira Landmine Museum. Next visit the temple in the 12th Century, Banteay Samré. Lunch at Angkor Café Restaurant in front of Angkor Wat. Angkor Wat, first half of 12th century: King Suryavarman II. 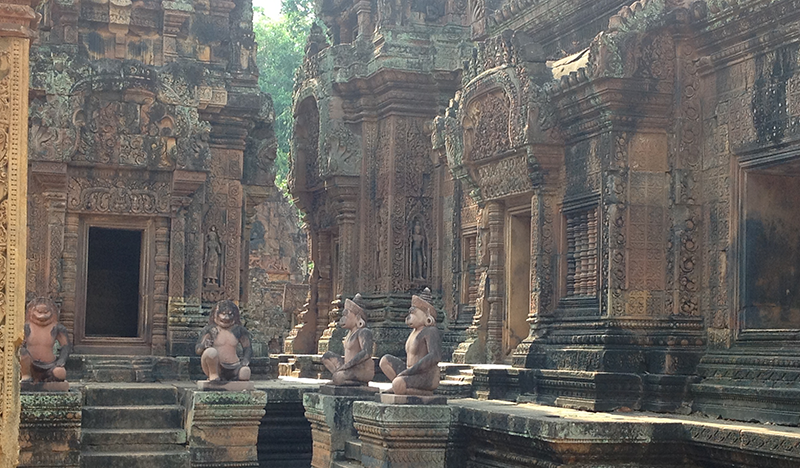 The largest of the Angkor group and one of the most intact, is an architectural masterpiece. Sunset Cocktail at Prasat Chrung, travel by Kungkea boat at the South moat of Angkor Thom. Angkor Thom, the last capital, was indeed a “Great City” as its name implies, and it served as the religious and administrative centre of the vast and powerful Khmer Empire. Southern Gate of Angkor Thom: The stone causeway across the broad moat surrounding the city of Angkor Thom with their unique gopuras, are one of the great sights at Angkor, never ceasing to fill visitors with wonder. The Southern Gate is flanked by a row of 54 stone figures on each side – gods to the left and demons to the right – to make a total of 108 mythical beings guarding the gate to the city. Bayon, late 12th century: The Bayon is, with Angkor Wat, one of the favourite monuments among visitors. The temple was build nearly 100 year after Angkor Wat. While its basic structure and earliest part of the temple are unknown, it is clear that the Bayon was built on top of an earlier monument, that the temple was not built at one time, and that it underwent a series of changes. Third Angkor capital (11th century): Baphuon, middle of 11th century: The massive size and grandeur of the Baphuon is unrecognisable today because much of the temple has either collapsed or been dismantled. The EFEO was restoring this temple when it was forced to abandon work and leave Angkor in 1972 because of war; they have now resumed their work. With a total cost estimated of USD 10 million, the restoration had been completed this year, and opened to tourists on July 28th in the same year. Phimeanakas, early 11th century: King Rajendravarman II. The temple, located inside the Royal Palace compound, was the temple where the king worshipped. Kingdom of Jayavarman VII (1181-1219): Terrace of the Elephants, end of 12th century: The terrace shows evidence of having been rebuild and added to; and it is believed that alterations took place during the reign of Jayavarman VII at the end of the 12th or beginning of the 13th century. The 300 meters long terrace has three main platforms and two subsidiary ones. One of the main attractions of this terrace is the facade decorated with elephants and their riders depicted in profile. Terrace of Leper King, end of 12th century: The curious name of this terrace refers to a statue of the Leper King that is on the platform of the terrace. The one you see today is a copy. The original is in the courtyard of the National Museum in Phnom Penh. Visit Ta Prohm, early 13th century: This temple was left untouched by archaeologists, except for the clearing of a path for visitors. Because of its natural state, it is possible to experience some of the wonder of the early explorers, when they came upon this monument in the middle of the 19th century. The monastic complex of Ta Prohm is one of the largest sites at Angkor. A Sanskrit inscription on stone, tells us that it took 79’365 people to maintain the temple, including 18 high priests, 2’740 officials, 2’202 assistance and 615 dancers. 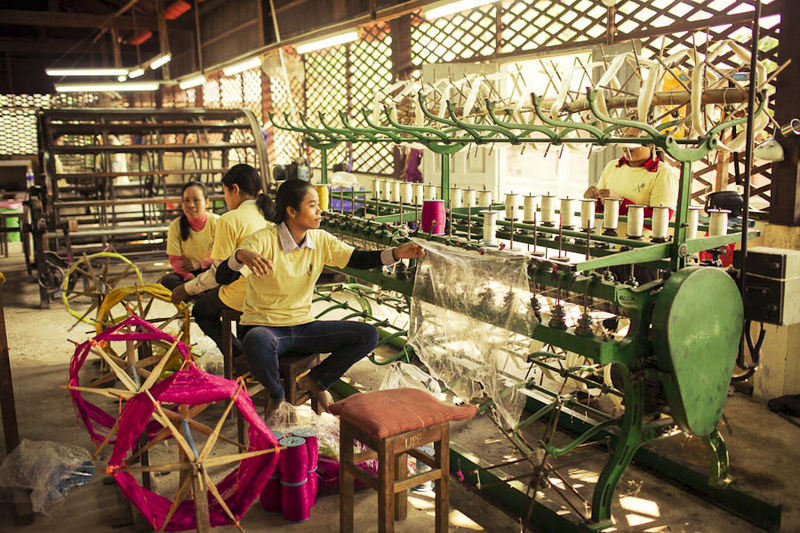 Angkor Silk Farm, to see and learn about the process from the mulberry bushes cultivation to the production of silk fabrics and accessories. As the Silk Farm covers an area of 8 hectares, of which 5 are used for the mulberry trees plantation, you will enjoy the beautiful setting while learning about the fascinating process of silk-making. During your visit, a professional guide who works on site will give you more details on the mulberry trees, silkworm farming, cocoon unwinding, preparation of the silk threads, ikat technique (tie-dyeing of the threads) and silk weaving. Continue your visit to artisans d’Angkor to see stone carving. Actually, artisans d’Angkor is the place best arts collections which is located in exact centre of town. Besides, stone and wood carvings, artisan is producing many kinds of silk products. Tour to the site will take about 30 minutes time. 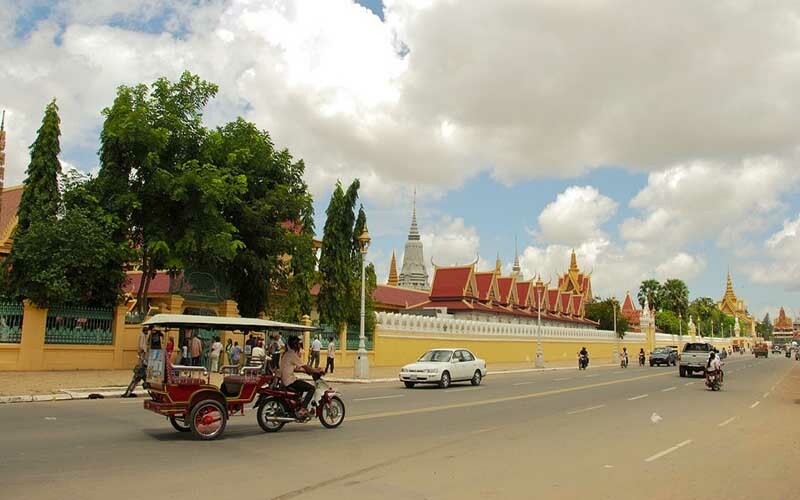 Free after breakfast – transfer to airport for flight to Phnom Penh. Meet your local host and transfer to the hotel check in. Time free and relax in the hotel. Enjoy your time at Spa, massage for about 60 minutes. Late afternoon, enjoy the sunset cocktail on the Mekong River and enjoy the relaxation spa in the hotel. After breakfast – starts the visit in Phnom Penh. First, National Museum, Located just north of the Royal Palace, the National Museum of Cambodia is housed in a graceful terracotta structure of traditional design (built 1917–20), with an inviting courtyard garden. The museum is home to the world’s finest collection of Khmer sculpture – a millennium’s worth and more of masterful Khmer design. Royal Palace, Built in 1866 by King Norodom the Royal palace is now home to His Majesty Preah Bat Samdech Preah Norodom Sihanouk, King of Cambodia, and Her Majesty Preah Reach Akka-Mohesey Norodom Monineath Sihanouk, the Queen of Cambodia. The Palace grounds are opened to the public except when the King is in residence. Within the palace compound are the coronation hall; the entrance, which houses an open-air theater for the Royal Dance Troupe, and a balcony for Royal appearances; an open-air pavilion often used for entertaining and viewing of the King’s movies; and the King’s private residence, which houses a collection of Cambodian artwork from artists around the world, and his office, where he actively pursues Royal duties. Wat Phnom is a sacred Buddhist pagoda prominently sat atop a small hill in the Cambodian capital city of Phnom Penh where it has been a central site in the city as religious sanctuary for prayers and offerings since 1373. Afternoon: Visit Tuol Sleng In 1975, Tuol Svay Prey High School was taken over by Pol Pot’s security force and turned into a prison known as Security Prison 21 (S-21). It soon became the largest such center of detention and torture in the country. Over 17,000 people held at S-21 were taken to the extermination camp at Choeung Ek to be executed; detainees who died during torture were buried in mass graves in the prison grounds. S-21 has been turned into the Tuol Sleng Museum, which serves as a testament to the crimes of the Khmer Rouge. The visit to the memorial killing field of Choeung Ek is available upon request. Lastly, visit the colonial building and Psar Thmei, “New Market”. Then at around 16:30 – transfer to the pier for the cruise on the Mekong for sunset. Return to the hotel for refreshment & dinner at Bopha Phnom Penh at the river front. Overnight. Today is your last day to say farewell to the Phnom Penh as well as Cambodia. We thanks for your visit and coming to Cambodia. Hope that you have enjoyed your trip and experienced the real life activities here and we are very much looking forward to welcome you back on the next vacation.